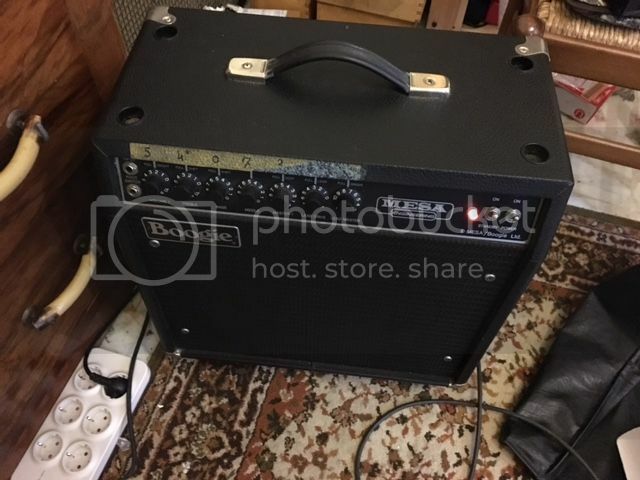 Mesa Boogie Mark IIC+ for sale in EU. With Reverb. Export 110v-240v. 60w. Exc conditions, with channel foot switch (no cable) included. Only a little hole (you can see it in the picture above the handle) in the tolex. If you prefer I can put a screw or a little black piece of wood to cover it. It has adhesive tape on front, but it's removable without any permanent sign of wear. It has (removable) wheels for an easy transport. Speaker is his original Black Shadow MS-12. In this last pic it is the one on the left. I can send other pictures. It's really "as new" for a 1985 amp! Contact me for any other info. I have 100% positive feedbacks (emanux) on TGP forum, D*A*M forum, Fretboard forum and on eBay (emasem).